The 2012 Formula One season was the 63rd season of the Formula One World Championship. The season had 20 races, starting in Australia on 18 March and ended in Brazil on 25 November. The 2012 season saw the return of the United States Grand Prix, which was held at the Circuit of the Americas, in Austin, Texas. After being cancelled in 2011 due to civil protests, the Bahrain Grand Prix also returned to the calendar. The start of the season was unpredictable, with seven different drivers winning the first seven races of the championship; a record for the series. It was not until the European Grand Prix in June that a driver, Ferrari's Fernando Alonso, won his second race of the year. Alonso was the championship leader for the next seven races, taking his third win in Germany and finishing on the podium in the United Kingdom, Italy and Singapore. However, first-lap retirements in Belgium and Japan allowed others to catch up, and defending World Champion Sebastian Vettel — like Alonso, a two-time winner — took the lead in the sixteenth race of the season. 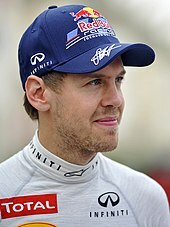 Vettel, too, had problems during the season; contact with a backmarker left him to finish outside the points in Malaysia, while alternator failures at the European and Italian Grands Prix cost him valuable points and exclusion from qualifying in Abu Dhabi led him to start from the pit lane. Vettel entered the final race of the season with a thirteen-point lead over Alonso. Alonso needed a podium finish to stand any chance of becoming World Drivers' Champion, but in a race that finished under the safety car, Vettel finished in sixth place, scoring enough points to win his third consecutive championship, becoming the third driver to do so. In the World Constructors' Championship, Red Bull Racing secured their third consecutive title when Sebastian Vettel finished second at the United States Grand Prix. The pre-season testing season began immediately after the 2011 Abu Dhabi Grand Prix with a three-day 'Young Driver Test' (for drivers with fewer than three Formula One race starts to their name) at the Yas Marina Circuit from 15–17 November 2011. Toro Rosso test driver and Formula Renault 3.5 Series runner-up Jean-Éric Vergne was the fastest driver in every session over the three-day test, driving for Red Bull Racing. The Young Driver Tests also saw the debut of Pirelli's 2012 tyre compounds, with all bar one of the tyre compounds used in 2011 having undergone significant revisions. Several teams, including Williams and Mercedes used the event to test parts for the 2012 season in the face of a ban on exhaust-blown diffusers. After a dispute between the Formula One Teams Association and the FIA in the first half of 2009, a new Concorde Agreement was signed on 1 August 2009 by the then FIA president Max Mosley and all of the existing teams. The new agreement provided for a continuation of the terms of the 1998 Concorde Agreement, and ran until 31 December 2012. In July 2011, Virgin Racing split with Wirth Research mid-season after a technical review by former Renault F1 Team engineering director Pat Symonds found that Virgin's CFD-only approach had failed. The team formed a technical partnership with McLaren that granted them access to McLaren's testing facilities as well as the purchase of Wirth Research facilities. Adrian Sutil left Force India, having spent six years with both the team and its previous incarnations, Spyker and Midland. He wanted to drive with Williams, before negotiations collapsed in December 2011. Sutil was later charged with grievous bodily harm after allegedly assaulting a senior Renault team member with a glass in a Shanghai nightclub following the 2011 Chinese Grand Prix. If convicted, Sutil could face up to one year in prison and be banned from entering China. Bernie Ecclestone wanted to see the calendar increase to a record 20 rounds, the maximum he feels is viable. However, a provisional calendar was announced in June 2011, with a record 21 races. FIA President Jean Todt later said that the 2012 calendar would have no more than 20, but did not say which race would be removed. 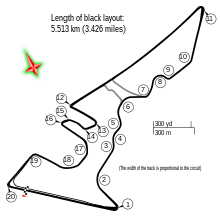 On 29 July 2011, a second provisional calendar was released, confirming that the Turkish Grand Prix would be discontinued. The final calendar was released on 7 December 2011. Organisers of the Korean Grand Prix said they were unhappy with the terms of their contract with Bernie Ecclestone and Formula One Management, particularly the cost of race-sanctioning fees, and asked to make a new contract, seeking more-favourable terms. However, Ecclestone ruled out renegotiations, stating that the initial negotiation process had been difficult enough, and that the organisers were aware of the terms of the contract when they first signed it. Ecclestone has stated that in the event that race organisers can not pay sanctioning fees, the Korean Grand Prix will be removed from the calendar. The final calendar released in December kept the Korean Grand Prix intact. In January 2012, organisers of the European Grand Prix wrote to Bernie Ecclestone about the race in Valencia. They felt it would not make money, and wanted to change the contract with Formula One Management to include "a substantial cost reduction". Organisers of the Spanish Grand Prix in Barcelona expressed similar misgivings over the state of their race. The 2011 season saw teams running "off-throttle blown diffusers", which created downforce by forcing fuel through the engine to produce exhaust gasses and directing it over the diffuser when the driver was not applying the throttle. This concept was originally banned in incremental phases, with increasingly restrictive rules on what teams could and could not do, with a full ban to be applied from the 2011 British Grand Prix onwards. However, the incremental ban was controversial, with several teams applying for and receiving permission to circumvent the total ban. After discussion between the FIA and engine manufacturers, the original regulations were restored, with the full ban delayed until 2012. The regulations in 2012 will govern the design of the exhaust with the teams agreeing to strict constraints on the position of the exhaust tailpipe. This will result in the exhaust exiting the bodywork much higher up than in 2011, and no longer near the diffuser. In October 2011, a clarification to the amended rules was issued, effectively banning "exotic" engine maps; in November, further amendments were introduced, completely banning the practice of blowing exhaust gasses over parts of the car to improve downforce, following a bid by several teams to allow it under certain conditions. In January 2012, the FIA banned the use of "reactive ride-height". The system, first proposed by Lotus in 2010 (but not applied until 2012), used hydraulic cylinders in the brake calipers and suspension push-rods to make minute adjustments to the ride height of the car, thereby keeping the ride height at an optimal level throughout the race and providing stability during braking. The FIA initially approved the device as being legal, and several teams, including Ferrari and Williams, gave plans to the FIA for their own versions of the device before it was banned one week later. No reason was given for the reversal of the decision, though it was reported that the reactive ride-height systems violated Article 3.15 of the technical regulations, which states that "any aerodynamic effect created by the suspension should be incidental to its primary function" and "any device that influences the car's aerodynamics must remain immobile in relation to the spring part of the car". All cars must now pass their mandatory FIA crash tests before they can take part in pre-season testing. Previously, passing the crash tests was only a requirement prior to the first race of the season. Crash tests for the 2012 season will also be more rigorous than in previous years. At the final meeting of the World Motorsports Commission in December 2011, a series of changes to the rules were published. Chief among these is the re-introduction of a rule that will allow all lapped traffic under the safety car to be released from the queue before the car returns to pit lane, allowing the drivers to unlap themselves and to ensure a clean restart. Drivers will not be able to leave the confines of the circuit without good reason. In 2011 drivers were seen using access roads around the circuit to shorten their reconnaissance and in-laps in order to save their fuel and tyres. Drivers will not be allowed to return to the normal racing line should they choose a defensive line going into a corner. Races will have a maximum four-hour time limit to prevent the indefinite suspension of a race. This will stop the theoretical possibility of a race lasting more than eight hours. This rule was introduced after the rain-interrupted 2011 Canadian Grand Prix, which set a record for the longest race in Formula One history, at four hours, four minutes and thirty-nine seconds. ↑ 1.0 1.1 "Vettel is champion, Button wins thriller". Autosport. Haymarket publications. 25 November 2012. Retrieved 25 November 2012. ↑ 2.0 2.1 "Formula One returns to the United States". Formula One Administration. 25 May 2010. Archived from the original on 6 June 2011. Retrieved 30 June 2011. ↑ Noble, Jonathan (9 June 2011). "Bahrain gives up on 2011 race". Autosport. Haymarket Publications. Retrieved 6 March 2012. ↑ 4.0 4.1 4.2 4.3 Collantine, Keith (7 December 2011). "United States Grand Prix remains on unchanged 2012 F1 calendar". F1 Fanatic. Keith Collantine. Retrieved 7 December 2011. ↑ Beer, Matt (10 June 2012). "Hamilton becomes seventh winner in seven races in the Canadian Grand Prix". Autosport. Haymarket Publications. Retrieved 11 June 2012. ↑ 6.0 6.1 "Alonso becomes first double winner in 2012 with superb European GP victory". Autosport. 24 June 2012. Retrieved 24 June 2012. ↑ "Formula 1 Großer Preis Santander von Deutschland 2012 — Results". Formula One World Championship Limited. 22 July 2012. Retrieved 22 July 2012. ↑ Beer, Matt (8 July 2012). "Mark Webber charges to superb British Grand Prix victory". Autosport. Haymarket Publications. Retrieved 8 July 2012. ↑ 9.0 9.1 "Formula 1 Gran Premio Santander d'Italia 2012 — Results". Formula One World Championship Limited. 9 September 2012. Retrieved 9 September 2012. ↑ "Vettel wins as Hamilton retires". Autosport. Haymarket Publications. 23 September 2012. Retrieved 23 September 2012. ↑ Collantine, Keith (2 September 2012). "Button storms to Spa win after first-lap shunt". F1 Fanatic. Keith Collantine. Retrieved 2 September 2012. ↑ Collantine, Keith (7 October 2012). "2012 Japanese Grand Prix review — Vettel's Suzuka masterclass as Alonso hits trouble". F1 Fanatic. Keith Collantine. Retrieved 11 October 2012. ↑ "2012 Formula 1 Petronas malaysia Grand Prix — Results". Formula One. 25 March 2012. Retrieved 25 March 2012. ↑ "Red Bull take tactical option of starting from pitlane". Sky Sports. BSkyB. 3 November 2012. Retrieved 3 November 2012. ↑ Collantine, Keith (18 November 2012). "Red Bull win third constructors' title in a row". F1 Fanatic. Keith Collantine. Retrieved 18 November 2012. ↑ Vermeeren, Frances (29 November 2011). "Comeback Räikkönen: a record number of champions". GP Now. Retrieved 29 May 2012. ↑ "Coletti to test for Toro Rosso in Abu Dhabi". 2 November 2011. Retrieved 2 November 2011. ↑ Straw, Edd (18 November 2011). "Jean-Eric Vergne fastest as Abu Dhabi young driver test ends". Autosport.com. Haymarket Publications. Retrieved 18 November 2011. ↑ Tremayne, Sam (14 November 2011). "Pirelli to trial 2012 compounds in Abu Dhabi Young Driver testing". Autosport.com. Haymarket Publications. Retrieved 15 November 2011. ↑ Straw, Edd (15 November 2011). "Williams tests 2012-spec top-exit exhaust system in Abu Dhabi". Autosport.com. Haymarket Publications. Retrieved 18 November 2011. ↑ Straw, Edd (17 November 2011). "Mercedes tries 2012-style exhaust in Abu Dhabi young driver test". Autosport.com. Haymarket Publications. Retrieved 18 November 2011. ↑ Beer, Matt (1 August 2009). "New Concorde Agreement finally signed". autosport.com. Haymarket Publications. Retrieved 2 August 2009. ↑ 23.0 23.1 23.2 "2012 FIA Formula One World Championship Entry List". FIA.com. Fédération Internationale de l'Automobile. 30 November 2011. Retrieved 30 November 2011. ↑ "Red Bull Racing and Infiniti increase Partnership". Red Bull Racing. Red Bull. 16 October 2011. Retrieved 29 November 2011. ↑ 26.0 26.1 Elizalde, Pablo (5 January 2012). "Sebastien Buemi confirmed as Red Bull Racing's reserve and test driver". Autosport. Haymarket Publications. Retrieved 5 January 2012. ↑ "Webber Signs With Red Bull For 2012". Redbull.com. Red Bull Racing. 27 August 2011. Archived from the original on 10 November 2011. Retrieved 27 August 2011. ↑ "New McLaren to debut at first test". Formula1.com. 19 December 2011. Retrieved 19 December 2011. ↑ Elizalde, Pablo (5 October 2011). "Button secures new multi-year contract at McLaren". Autosport. Haymarket Publications. Retrieved 5 October 2011. ↑ Noble, Jonathan (5 July 2011). "Gary Paffett extends McLaren test and reserve contract". Autosport.com. Haymarket Publications. Retrieved 6 July 2011. ↑ "Lewis extends McLaren stay until 2012". Manipe F1. 18 January 2008. Retrieved 19 May 2008. ↑ Cooper, Adam (8 July 2011). "Ferrari Drops Marlboro From Team Name". speedtv.com. Speed. Retrieved 8 July 2011. 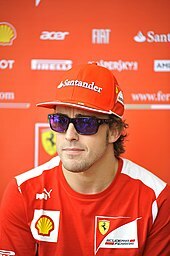 ↑ "Fernando Alonso signs for Ferrari". Scuderia Ferrari. Ferrari. 30 September 2009. Archived from the original on 10 November 2011. Retrieved 23 June 2011. ↑ 34.0 34.1 34.2 "Other Drivers". Ferrari.com. Scuderia Ferrari. ↑ Elizalde, Pablo (9 June 2010). "Massa extends Ferrari contract until '12". Autosport. Haymarket Publications. Retrieved 9 June 2010. ↑ 36.0 36.1 "SILVER ARROWS WORKS TEAM TO RACE AS MERCEDES AMG PETRONAS FORMULA ONE TEAM". Mercedes GP. Mercedes GP. Retrieved 5 December 2011. ↑ "Mercedes delay track debut of 2012 F1 car". The Sydney Morning Herald. 6 December 2011. Retrieved 6 December 2011. ↑ "Schumacher could stay in F1 after 2012". Espnf1.com. ESPN. 27 January 2010. Retrieved 25 July 2010. ↑ "Rosberg extends Mercedes contract". EspnF1.con. ESPN. 10 November 2011. Retrieved 10 November 2011. ↑ 40.0 40.1 "Kimi Räikkönen back in F1 with LRGP in 2012". Lotus Renault GP. 29 November 2011. Retrieved 29 November 2011. ↑ 41.0 41.1 41.2 41.3 "Romain Grosjean joins Kimi Raikkonen at Lotus Renault for 2012". Autosport.com. Haymarket Publications. 9 December 2011. Retrieved 9 December 2011. ↑ 42.0 42.1 "Sahara India Pariwar announces co-ownership of the Force India Formula One Team with Dr. Vijay Mallya". Forceindiaf1.com. Force India F1 Team. 12 October 2011. Archived from the original on 10 November 2011. Retrieved 12 October 2011. ↑ "Force India". Formula1.com. 14 December 2011. Retrieved 14 December 2011. ↑ 44.0 44.1 44.2 44.3 "Hulkenberg joins Di Resta in Force India's 2012 line-up". Formula1.com. Formula One Administration. 16 December 2011. Retrieved 16 December 2011. ↑ "Sauber". Formula1.com. 14 December 2011. Retrieved 14 December 2011. ↑ 46.0 46.1 46.2 "Kobayashi and Perez to stay at Sauber in 2012". Formula1.com. Formula One World Championship. 28 July 2011. Retrieved 28 July 2011. ↑ "Toro Rosso technical director Giorgio Ascanelli – Tech talk". Red Bull. 10 September 2011. Retrieved 29 November 2011. ↑ 48.0 48.1 48.2 48.3 48.4 48.5 "Ricciardo earns Toro Rosso ride". The Australian. News Limited. Agence France-Presse. 15 December 2011. Retrieved 15 December 2011. ↑ Elizalde, Pablo (4 January 2012). "Williams looking for new title sponsor after splitting with AT&T". Autosport.com. Haymarket Publications. Retrieved 4 January 2012. ↑ "Williams F1". Williams F1. Williams F1. 4 January 2012. Retrieved 4 January 2012. ↑ "Williams". Formula1.com. 14 December 2011. Retrieved 14 December 2011. ↑ 52.0 52.1 Beer, Matt (4 July 2011). "Williams to run Renault engines again from 2012". Autosport. Haymarket Publications. Retrieved 4 July 2011. ↑ 53.0 53.1 "Pastor Maldonado Confirmed for 2012 with Valtteri Bottas as Reserve Driver". Williams F1. 1 December 2011. Retrieved 1 December 2011. ↑ 54.0 54.1 54.2 Elizalde, Pablo (17 January 2012). "Williams confirms Bruno Senna will race for the team in F1 in 2012". Autosport. Haymarket Publications. Retrieved 17 January 2012. ↑ "FIA formally confirms that Renault, Lotus and Virgin can change names". Autosport. Haymarket Publications. 6 November 2011. Retrieved 6 November 2011. ↑ "FIA confirms team name changes for 2012". formula1.com. Retrieved 6 November 2011. ↑ "Team Lotus Notes, pages 55". Team Lotus Notes. December 2011. Retrieved 14 December 2011. ↑ "Pit & Paddock: Third year for Trulli and Kovalainen". Autosport (Haymarket Publications) 205 (11): p. 12. 15 September 2011. "Heikki Kovalainen and Jarno Trulli will continue to drive for Team Lotus next season. Trulli was, as expected, officially announced as a 2012 driver by the team last weekend, while team boss Tony Fernandes confirmed to Autosport that Kovalainen will also be staying on.". ↑ "Caterham signs Giedo van der Garde as reserve driver". Autosport. Haymarket Publications. 4 February 2012. Retrieved 4 February 2012. ↑ "HRT renews and extends its technical collaboration with Williams F1". HRT F1 Team. HRT F1. Retrieved 5 December 2011. ↑ "HRT". Formula1.com. 14 December 2011. Retrieved 14 December 2011. ↑ 62.0 62.1 Beer, Matt (21 November 2011). "Pedro de la Rosa signs for HRT from 2012". Autosport. Haymarket Publications. Retrieved 21 November 2011. ↑ "Narain Karthikeyan completes HRTs lineup for 2012". HRT F1. 3 February 2012. Retrieved 3 February 2012. ↑ Smotrov, Alexandr (11 November 2010). "Russia enters Formula 1 as company takes 'significant stake' in Virgin team". RIA Novosti. Retrieved 11 November 2010. ↑ "Inside the MR01 — Coming Soon". Marussia F1 Team. Marussia F1. Retrieved 4 January 2012. ↑ Strang, Simon (24 July 2011). "Timo Glock has re-signed with Virgin on a new three-year deal". Autosport. Haymarket Publications. Retrieved 24 July 2011. ↑ 67.0 67.1 67.2 "Marussia Virgin Racing Completes 2012 Race Driver Line-up". Virgin Racing. 27 November 2011. Retrieved 27 November 2011. ↑ "Virgin to break ties with technical partners Wirth". Formula1.com. Formula One Association. 2 February 2011. Retrieved 25 August 2011. ↑ Noble, Jonathan (4 July 2011). "Virgin enters into technical partnership with McLaren". Autosport. Haymarket Publications. Retrieved 25 August 2011. ↑ Noble, Jonathan (3 November 2011). "Formula 1 chiefs approve name changes for Lotus, Renault and Virgin". Autosport.com. Haymarket Publications. Retrieved 4 November 2011. ↑ Cooper, Adam (3 November 2011). "Caterham, Lotus and Marussia name changes approved". Adam Cooper's F1 Blog. WordPress. Retrieved 4 November 2011. ↑ "Group Lotus Plc and Proton Holdings Berhad, 1Malaysia Racing Team, Caterham Cars and Tony Fernandes". 9 November 2011. Retrieved 9 November 2011. ↑ Collantine, Keith (9 November 2011). "Lotus confirms 2012 name change to Caterham". F1 Fanatic. Keith Collantine. Retrieved 9 November 2011. ↑ Collantine, Keith (14 December 2011). "Colin Kolles leaves HRT". F1 Fanatic. Keith Collantine. Retrieved 14 December 2011. ↑ Collantine, Keith (15 December 2011). "Perez-Sala takes over as HRT team principal". F1 Fanatic. Keith Collantine. Retrieved 15 December 2011. ↑ Saward, Joe (11 January 2012). "Meanwhile in Valencia". Joe Saward Blogs About the World of F1. WordPress. Retrieved 12 January 2012. ↑ "Alguersuari 'says no' to HRT". Sky Sports. British Sky Broadcasting. 8 January 2012. Retrieved 9 January 2012. ↑ "Buemi eying 2013 F1 race seat". Hindustan Times. HT Media. 7 January 2012. Retrieved 8 January 2012. ↑ Noble, Jonathan; Evans, David; Lostia, Michele (6 February 2011). "Kubica suffers multiple fractures". Autosport. Haymarket Publications. Retrieved 23 November 2011. ↑ "Robert Kubica to miss start of 2012 Season". Lotus Renault GP. 23 November 2011. Retrieved 23 November 2011. ↑ Noble, Jonathan (13 November 2011). "Eric Boullier says Renault will keep door open for Robert Kubica through 2012". Autosport. Haymarket Publications. Retrieved 23 November 2011. ↑ Shah, Kunal (21 December 2011). "Vitantonio Liuzzi Is Excited About Participating In The i1 Super Series". iSport India. Retrieved 21 December 2011. ↑ "Petrov confirmed at Renault until 2012". Formula1.com. Formula One Administration. 22 December 2010. Retrieved 28 July 2011. ↑ "Kimi and Williams F1 «". Joesaward.wordpress.com. 23 September 2011. Retrieved 5 November 2011. ↑ Noble, Jonathan (17 January 2012). "Bruno Senna says he has family support to drive for Williams F1 team". Autosport.com. Haymarket Publications. Retrieved 17 January 2012. ↑ Heublein, Stephan (17 January 2012). "Senna signs deal to complete Williams lineup". Autoblog. Retrieved 17 January 2012. ↑ "Sutil unsurprised by Senna deal". SkySports.com. BSkyB. 19 January 2012. Retrieved 19 January 2012. ↑ "Adrian Sutil Charged with Causing Grievous Bodily Harm". F1 Orbit. Motorsport.com. 12 January 2012. Retrieved 12 January 2012. ↑ Wood, Ryan (12 January 2012). "Sutil could face prison sentence for assault". The F1 Times. Total F1. Retrieved 12 January 2012. ↑ "FIA reveals 21-race calendar for 2012". gpupdate.net. gpupdate.net. 3 June 2011. Retrieved 3 June 2011. ↑ Elizalde, Pablo (7 June 2011). "Todt says 2012 will have 20 races". Autosport. Haymarket Publications. Retrieved 7 June 2011. ↑ Elizalde, Pablo (29 July 2011). "2012 Formula 1 season opener keeps March 18 slot despite overhaul". Autosport. Haymarket Publications. Retrieved 29 July 2011. ↑ "Valencia to be second F1 street track in 2008". 10 May 2007. Retrieved 18 January 2010. ↑ "Bernie signs Valencia GP contract". UpdateF1. 3 June 2007. Retrieved 22 February 2010. ↑ "Silverstone signs 17-year deal for British Grand Prix". BBC Sport. 7 December 2009. Retrieved 18 January 2010. ↑ "Hockenheim handed reprieve". PlanetF1.com. 1 October 2009. Retrieved 10 March 2010. ↑ "Spa extends Grand Prix contract to 2012". www.grandprix.com. 6 June 2008. Retrieved 18 January 2010. ↑ "Monza to keep Formula 1's Italian Grand Prix". BBC Sport. BBC. 18 March 2010. Retrieved 19 March 2010. ↑ "Singapore looking to change track layout". ESPN F1. 29 January 2010. Retrieved 22 February 2010. ↑ Benson, Andrew (9 March 2011). "Suzuka GP deal extended to 2012". BBC News. ↑ "Austin circuit layout revealed". formula1.com. Formula One Administration. 1 September 2010. Retrieved 11 January 2012. ↑ "Formula One returns to the United States". formula1.com. Formula One Administration. 25 May 2010. Retrieved 25 May 2010. ↑ 113.0 113.1 Noble, Jonathan (1 November 2011). "Formula 1 chiefs to discuss 2012 calendar amid concerns over some races". Autosport. Haymarket Publications. Retrieved 1 November 2011. ↑ Elizalde, Pablo (30 November 2011). "Bernie Ecclestone gives Austin organisers a new deadline to sort contracts". Autosport.com. Haymarket Publications. Retrieved 1 December 2011. ↑ Parkes, Ian (16 November 2011). "US Grand Prix on verge of being axed claims Bernie Ecclestone". The Independent. Independent Print Ltd. Retrieved 17 November 2011. ↑ Maher, John (7 December 2011). "F1 boss confirms deal with Austin organizers has been reached". The Statesman. Retrieved 8 December 2011. ↑ "Bahrain F1 Grand Prix dropped for 2011". Yahoo. 10 June 2011. Retrieved 10 June 2011. ↑ Noble, Jonathan (9 October 2011). "Teams express concern over ongoing political situation in Bahrain". Autosport. Haymarket Publications. Retrieved 1 November 2011. ↑ Ferris-lay, Claire (8 January 2012). "F1 teams urged to boycott Bahrain Grand Prix". Arabian Business. ITP Publishing Group. Retrieved 8 January 2012. ↑ Noble, Jonathan; Tremayne, Sam (8 August 2011). "Turkey hopeful of 2012 GP reprieve". Autosport. Haymarket Publications. Retrieved 1 November 2011. ↑ "City Council endorses F1, agrees to environmental deal". American Statesman. American Statesman. 29 June 2011. Retrieved 30 June 2011. ↑ Strang, Simon (8 April 2011). "Abu Dhabi to make track changes". Autosport. Haymarket Publications. Retrieved 8 April 2011. ↑ Beer, Matt (4 July 2011). "Abu Dhabi Grand Prix postpones track changes as 2011 rules may make them unnecessary". Autosport. Haymarket Publications. Retrieved 6 July 2011. ↑ Noble, Jonathan (18 October 2011). "Korea seeks to renegotiate GP contract". Autosport. Haymarket Publications. Retrieved 28 October 2011. ↑ Noble, Jonathan (18 October 2011). "Q & A with Korean Grand Prix promoter Won-Hwa Park". Autosport. Haymarket Publications. Retrieved 28 October 2011. ↑ Noble, Jonathan (27 October 2011). "Bernie Ecclestone casts doubt on future of Korean GP". Autosport. Haymarket Publications. Retrieved 28 October 2011. ↑ "Valencia in talks to cut cost of F1 race". Reuters. 19 January 2012. Retrieved 20 January 2012. ↑ "Una carta a Ecclestone" [A Letter to Ecclestone]. El País (in Spanish). Ediciones El País, S.L. 5 January 2012. Retrieved 6 January 2012. ↑ Elizalde, Pablo (9 January 2012). "Barcelona government may reconsider F1 grand prix deal". Autosport.com. Haymarket Publications. Retrieved 9 January 2012. ↑ "Exhausts to be raised for 2012". gpupdate.net. GPUpdate. 14 July 2011. Retrieved 14 July 2011. ↑ Allen, James (20 October 2011). "Radical changes to engine maps for 2012 give power back to designers". James Allen on F1. James Allen. Retrieved 1 November 2011. ↑ Noble, Jonathan (11 November 2011). "No off-throttle blowing allowed in 2012 as teams block bid to allow the practice". Autosport.com. Haymarket Publications. Retrieved 12 November 2011. ↑ Noble, Jonathan (21 January 2012). "Formula 1 teams have been told by the FIA that reactive ride height systems will be banned for the 2012 season". Autosport.com. Haymarket Publications. Retrieved 21 January 2012. ↑ Allen, James (10 January 2012). "Has Lotus Renault found this year's must-have gizmo?". James Allen on F1. James Allen. Retrieved 21 January 2012. ↑ Noble, Jonathan (11 January 2012). "Lotus's rivals set to be forced to copy innovative reactive ride height system". Autosport.com. Haymarket Publications. Retrieved 21 January 2012. ↑ Noble, Jonathan (12 January 2012). "Ferrari has developed its own reactive ride-height system for 2012 F1 car". Autosport.com. Haymarket Publications. Retrieved 21 January 2012. ↑ Allen, James (21 January 2012). "FIA sends note to teams: Reactive suspension system is not legal". James Allen on F1. James Allen. Retrieved 21 January 2012. ↑ Scarborough, Craig (27 October 2011). "2012: Nose height Regulations". ScarbsF1. WordPress. Retrieved 6 November 2011. ↑ Rencken, Dieter. "Why Geneva meeting matters for F1". Autosport.com (subscription required). Haymarket Publications. ↑ 141.0 141.1 141.2 Elizalde, Pablo (7 December 2011). "FIA announces new sporting rules for 2012 Formula 1 season". autosport.com. Haymarket Publications. Retrieved 8 December 2011. ↑ Noble, Jonathan (19 December 2011). "McLaren will be ready for first 2012 Formula 1 test". Autosport.com. Haymarket Publications. Retrieved 19 December 2011. ↑ Noble, Jonathan (28 August 2011). "Formula 1 teams pick Mugello for 2012's new mid-season test". Autosport. Haymarket Publications. Retrieved 31 August 2011. ↑ Straw, Edd (22 December 2011). "Ferrari pushing for increase in F1 testing limit, so as not to stifle opportunities for young drivers". Autosport.com. Haymarket Publications. Retrieved 22 December 2011. ↑ "World Motor Sport Council: 23/09/2011". fia.com. Fédération Internationale de l'Automobile. 23 September 2011. Retrieved 1 November 2011. ↑ Noble, Jonathan (11 October 2011). "Renault backs Formula 1 team name change to Lotus". Autosport. Haymarket Publications. Retrieved 1 November 2011. ↑ Noble, Jonathan (1 November 2011). "Virgin applies for name change to become Marussia". Autosport. Haymarket Publications. Retrieved 1 November 2011. ↑ Noble, Jonathan (18 October 2011). "Ferrari: No issue with Lotus name change". Autosport. Haymarket Publications. Retrieved 1 November 2011. ↑ Collantine, Keith (7 December 2011). "Lapped cars allowed to pass safety car again in 2012". F1 Fanatic. Keith Collantine. Retrieved 7 December 2011. ↑ 150.0 150.1 Collantine, Keith (7 December 2011). "Four-hour time limit among new 2012 rules". F1 Fanatic. Keith Collantine. Retrieved 8 December 2011. ↑ Noble, Jonathan (30 July 2011). "Formula 1 teams accept there is no going back on Sky deal". Autosport. Haymarket Publications. Retrieved 31 July 2011. ↑ Noble, Jonathan (2 September 2011). "BBC to face questioning from MPs over switch to shared F1 coverage". Autosport. Haymarket Publciations. Retrieved 2 September 2011. ↑ Tremayne, Sam (25 November 2011). "Sky Sports to launch bespoke F1 channel for 2012 coverage". Autosport.com. Haymarket Publications. Retrieved 25 November 2011. ↑ Collantine, Keith (2 December 2011). "Ferrari confirms departure from FOTA". F1 Fanatic. Keith Collantine. Retrieved 8 December 2011. ↑ Cooper, Adam (2 December 2011). "Red Bull out of FOTA but still "committed to cost saving"". Adam Cooper's F1 Blog. Adam Cooper. Retrieved 8 December 2011. ↑ Straw, Edd; Beer, Matt (10 December 2011). "Christian Horner insists Red Bull Racing still committed to cost controls despite FOTA exit". Autosport.com. Haymarket Publications. Retrieved 11 December 2011. ↑ "Sauber also confirms FOTA exit, Scuderia Toro Rosso could follow". Autosport.com. Haymarket Publications. 7 December 2011. Retrieved 8 December 2011. This page was last changed on 19 January 2019, at 20:34.